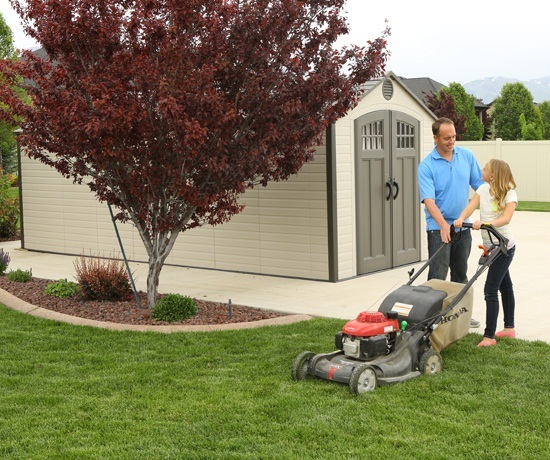 Restore the beauty to the yard by cleaning up the clutter. 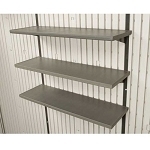 Store items for your business or organize the attic. 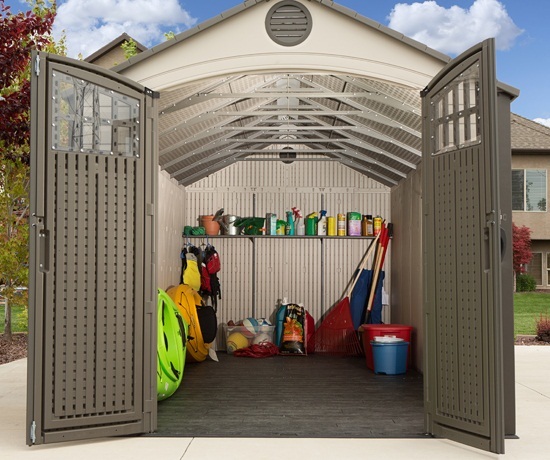 This storage shed is simple to build and goes up in a matter of hours. Can be locked with a padlock and is built to last for years. 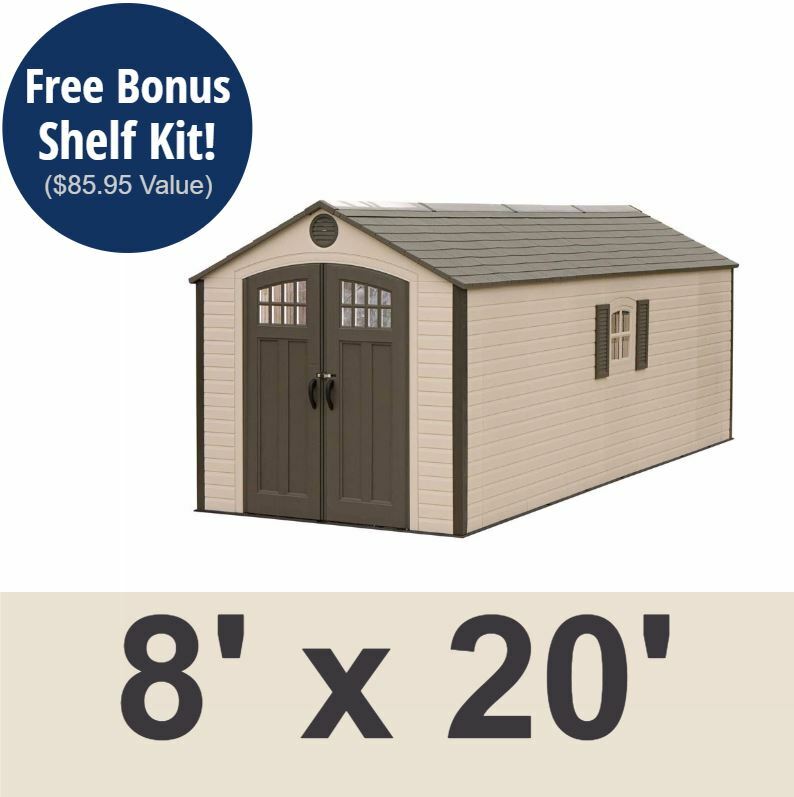 The Lifetime 8' x 20' Outdoor Storage Shed features: (2) windows, (2) sets of shutters, (2) 10-foot ridge cap skylights, (1) 90" shelf, (4) corner shelves, and (1) set of peg strips. Floor and installation hardware included. Comes in (2) boxes. 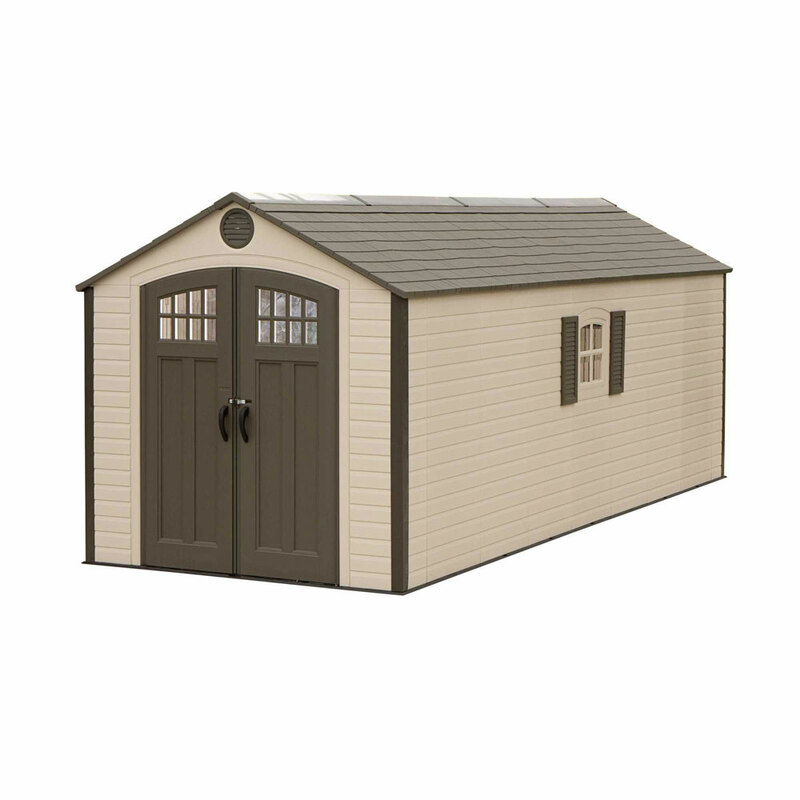 Warranty 60120 Shed includes a 10-year factory warranty. 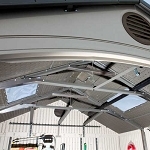 Roof and Doors are Gray (brownish gray). Black tread floor included (foundation required). Decorative windows for additional lighting. Two Skylights along the roof ridge included. One Set of Peg Strips. Dual Wall Panels for Rigidity. Exterior Roof Width is 96"
Interior Height Minimum is 70"
Interior Height Maximum is 94"
Interior Headroom (truss to floor) 80"
Impressed with all lifetime sheds. Built well. Goes up easy. A: We do offer financing through PayPal credit. Simply add the item to your cart and choose to check out through PayPal to see financing options with no interest minimum payments. A: Yes, we have the 60127 which has an opening on the front and the side. Q: I live in Ohio where we can get quite a bit of snow. Do I need a snow load kit for the 8x20 ft (60120) lifetime Shed? 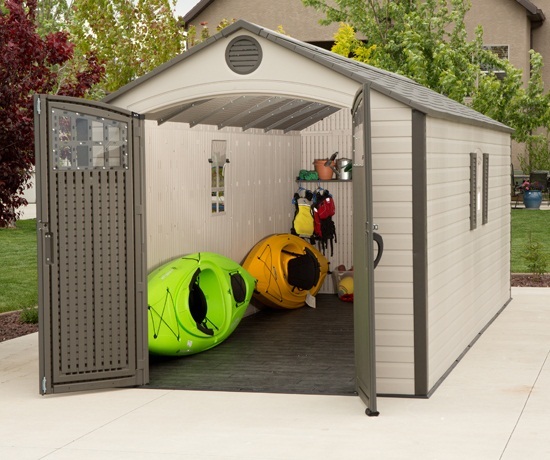 A: The shed by itself can withstand up to 23 pounds per Square foot. Though that will probably be enough, it is much better to be safe than sorry. You are welcome to order the 60045 Snow load kit. 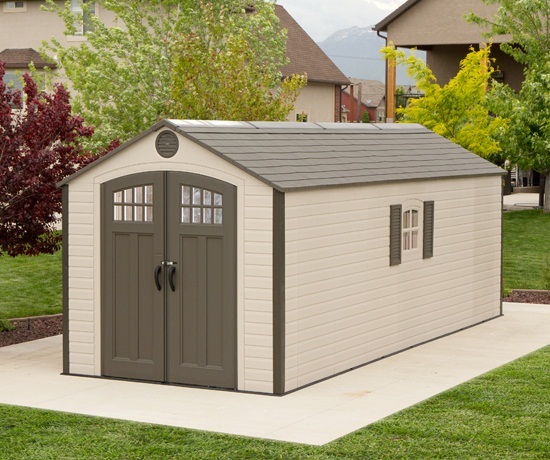 Q: Can this storage shed be 10 ft x 20 ft? A: On this particular shed you can change the depth, but not the width. In other words you can make it deeper than 20 feet, but it cannot be wider than 8 feet. Q: How long does it take to set up the 60120 Lifetime shed kit? A: It takes about 10 hours with 2 people. Assembly time may vary. Q: Does this shed come in different colors? A: It does not come in other colors. The walls are desert tan and the roof and doors are gray. Shipping: Orders for the 60120 Lifetime 8 x 20 Storage Building generally leave the warehouse the next business day. Shed model 60120 comes in 4 boxes. Box 1 is labeled 601201 and weighs 223 pounds, 96 x 32 x 13. Box 2 is labeled 601202 and weighs 251 pounds, 96 x 32 x 12. Box 3 is labeled 601203 and weighs 160 pounds, 96 x 32 x 12. Box 4 is labeled 601204 and weighs 152 pounds, 96 x 32 x 8. Dimensions: 235" x 96" x 93"